Day five of our travel endeavors was tough. As we set out to reach the coastline of Maratea, the weather would not cooperate with us. It was unusually cold for this time of year, especially for the southern part of Italy. We had hoped until the end that the tide would turn. Unfortunately, it didn’t. After more than two hours of travelling in the car, we arrived at our destination. The pouring rain and gusting winds prevented us from continuing with our plans to shoot on a sailboat while a local sailor cooked the freshly caught fish. Oh well, much to our soundman’s happiness, this part of our journey was cancelled. We ate lunch in a local restaurant instead as we reconvened for our next stop at Rotonda. In Rotanda we met Peppe Consenza, local guide of one of Italy’s most treasured national parks located in Basilicata; Il Pollino. Peppe welcomed us with espresso coffee and gelato and introduced us to a house filled with a generation of women ready to prepare “i taglioni a mano con ceci e fagioli”; thinly sliced elongated egg pasta, with chickpeas and white beans. 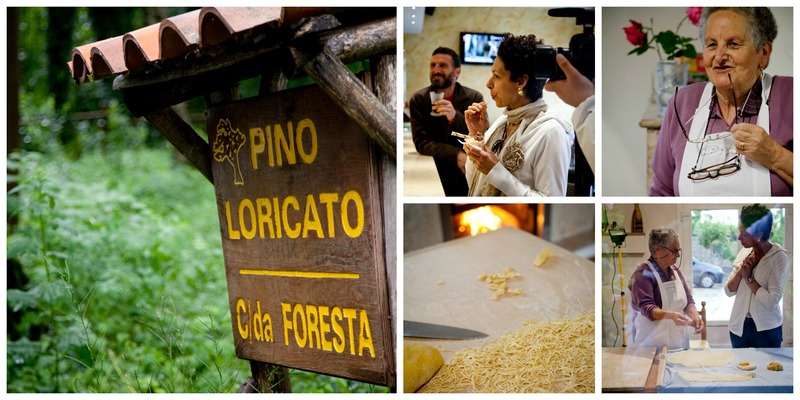 Peppe’s aunt, mother and grandmother were eager to demonstrate how this hand-crafted pasta is obtained. I had to set the pace or risk missing some important footage. If it hadn’t been for my systematic interference requesting that we “do it again” to make sure I wouldn’t miss a beat, the dish would have been ready in less than 30min. With all the commotion it took about 50min. It was amazing to see how all the women, no matter from which generation, worked together in preparing the food.Their confidence was indisputable. Intimidated, the men sat quietly in the background not daring to venture to work the dough or mould it, almost fearing a reprimand from their respective wives. But the meal was delectable. Who would have thought that noodles and beans could be so mouth watering?